Do you have a start-up plan? Are you novice to donkey trekking? Or do you already have a well established structure and many years of experience? Have you heard about the FNAR? If you still have a few unanswered questions, the following text, we hope, will answer all of them and help you get a better idea of us. The FNAR was born in 1990, the result of the volunteering of several pioneers of donkey trekking. They numbered around ten from the whole of France, at a period where donkey trekking was considered secondary and was almost completely marginalized. Today, they bring together around 60 donkey drivers, who have decided to come together to form an adaptable associative structure with the objective of promoting and defending donkeys and trekking with pack donkeys. This federation welcomes all donkey drivers, whatever be the number of donkeys they own and the type of trekking they practice. 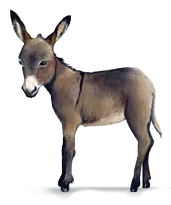 Get people to know about the donkey, promote its rearing, inform people about its qualities as a pack donkey as well as a cart donkey. Encourage its use as a pack donkey in pedestrian treks. Promote all studies, actions and researches undertaken on the donkey, as well as all training offered on the areas of its rearing and its use. Promotion undertaken for the larger audience. 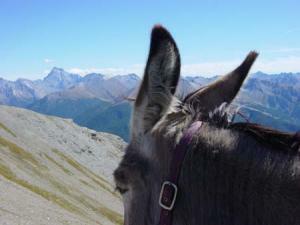 Diffuse and promote trekking with pack donkeys. The setting up of a website www.ane-et-rando.com, presenting diverse information about donkeys, trekking, the various deals and packages, and all the donkey drivers who are members of the FNAR. Publish a booklet that presents promotional information. Take part in exhibitions and shows, both in France as well as abroad. Distribute advertisements and articles in different magazines to get the attention of professionals as well as the larger audience. Allow donkey drivers to take part in discussions and to share diverse information on the internet forum reserved for its members. By discussing and sharing information on diverse subjects such as, insurance, legal status, taxation, and also by exchanging of practical bits of information, the FNAR makes sure the quality of the services improve. The edition of a guidebook for donkey trekking and the study of the different donkey trekking equipment are further efforts aimed at the improvement of services. The resources of the FNAR come from the members’ subscriptions and contributions, and the generous donations that come our way. The brain of the association are made up of the decisions that are commonly adopted during the annual general assembly, the distribution of work in the form of commissions: - breeding farms – health – internet – exhibitions and shows – journalists – new members – external relations – as well as the secretarial office, the responsibilities of which have been taken upon by one of our donkey driver members. The annual General Meetings are periods that hold strong activity in the life of the association. Taking place over 2 to 3 days in the home of one of our donkey drivers, this gathering permits all its members to get to know one another and to address each other directly. During this meeting, the various orientations towards which the FNAR is inclined to in the coming year is taken into account. This is also a time when a variety of information regarding the experiences with donkeys, trekking and its rearing is discussed and shared. Between two general meetings, the functioning of the FNAR is not at a standstill: the internet forum on the website ane-et-rando.com, which is reserved exclusively to members, allows each one to give their opinions on the actions in progress, and to share their difficulties and experiences in all areas (rearing, health, diet and nutrition, legal aid, equipment, trekking, etc.). In a nutshell, a lot of volunteering and good will guarantees the good functioning of our federation. The ambiance of the FNAR is friendly and relaxed, marked by relations that are based on trust and solidarity, and indeed punctuated by the many colorful discussions that take place. The FNAR is what its members make of it! The support membership: for donkey lovers and for our old members… who would like to support the objectives of the FNAR aimed at the rehabilitation and the showcase of the value of donkeys. The discovery and exploration membership​: This membership suits those who are carrying out various projects, as well as non members who wish to discover the FNAR and its mode of operation. Both these deals allow you to participate in the various discussions that take place in our internet forums, to meet donkey drivers in our various donkey driver’s cafés held regionally and to take part in our various interventions proposed during the first day of the General Meeting of the FNAR. These deals also permit you to participate in this General Meeting (without the right to vote) and to receive the minutes of the activities of the association. The membership for donkey drivers who are new to the organization: This membership is advantageous to new donkey drivers as well as to those who have a set up plan. The subscription fare for this membership, is comparatively lower, so as to help these new members build their activity. Except for the printing of their names on the pamphlets, they benefit from all the advantages and services that a full subscription payment provides. They are expected to respect the entry rules of the federation. Membership for the donkey driver who is also a trekking organize: This membership is not only for all donkey drivers who organize professional treks, but also for those who are new to donkey trekking and who take active part in the various activities of the FNAR, since a period of two years. The validation of the membership depends on certain entry rules. It also depends on the candidate’s participation and presence in the annual General Meeting in autumn. Leave your contact information at this email address: adherents@ane-et-rando.com. One of our associates will get in touch with you as soon as possible and keep you informed regarding further procedures. The General meeting takes place every year in autumn (October or November) at the home of one of our members. This is the perfect occasion to meet up with other donkey drivers and take important decisions regarding our association. If you would like to meet us, join us there.